You may have noticed that I love to make birthday cards, and have even made other greeting cards and invitations by hand. You may also have noticed that I haven't had a lot of time lately! My daughter is 13 months old now and takes up most of my time and attention, and when she's with my husband or having a nap, I'm doing housework or preparing her meals or one of a myriad of other chores. So the opportunity to review Paperless Post couldn't have come at a better time. This is a site that allows you to create online cards and invitations, either by using one of the thousands of designs they offer, or uploading your own. I had a go at making a few cards - I started with an invitation to my birthday celebrations and a photo upload Easter card. The site is very easy to use and the end result looks really professional. The cards are received as an email where you can watch an envelope opening and the card coming out, and there are options to reply or leave a comment on the site. My friends and family thought the cards were lovely and I was impressed with the site. The card are fully customisable. To make my birthday invitation, I searched for 40th birthday invitations and chose one of the designs. 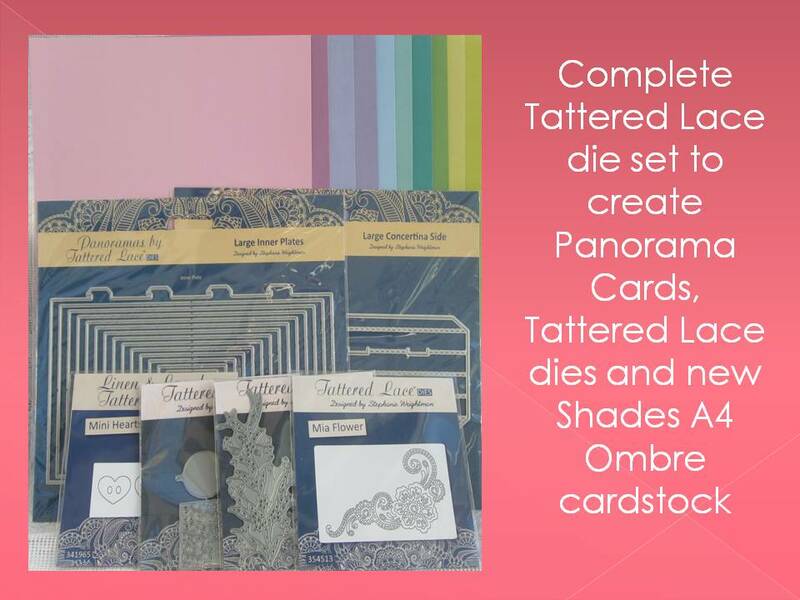 I was then not only able to enter the text I wanted but change the font, colour and size of the text, choose a background pattern to go behind the card, and pick the design of the envelope. You can also add a particular stamp and postmark to the card if you like. For my birthday invitation I included a RSVP card; if you are making wedding invitations and want extra options like a card for guests to fill in their menu choices you can add that as well. You can also use the site to send messages to guests if there is information or a change of plans (or just send them an event reminder) that they need to know. I was pleasantly surprised at how many different cards are on the site with themes like invitations to a barbecue or picnic, a hen party, a moving house announcement and so on. There are even designer collections like Oscar de la Renta and Kate Spade cards. 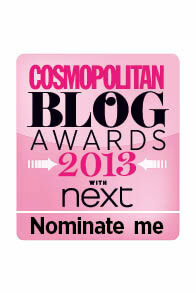 I can definitely see myself using this on a regular basis! The site uses its own currency called 'coins' which you buy in packages, starting at 25 coins for £8 but the price per unit decreases eg 100 coins for £18 and 200 coins for £28. You get 25 coins free when you sign up for an account and can get extra coins for doing things like liking Paperless Post on Facebook. My fairly simple birthday invite plus envelope and reply card cost 6 coins per invite. There are e-flyers which are free of charge to make and obviously the more you add to a card (eg extra sections for a wedding invite) the more they cost, but these are still pretty reasonably priced and much cheaper than buying and posting a physical greetings card - plus they are better for the environment. But if you do want a physical printed invitation or card there is an option on the site for that as well. I was very happy with the online cards and another benefit is that they are very quick - I didn't do the Easter cards until Good Friday and they only took a few minutes to create and send, whereas if I had bought cards and put them in the post, they wouldn't have arrived until after Easter! Thanks to Paperless Post for some coins to use on their site. All opinions are my own. I've got laryngitis at the moment so we had to cancel the visit to my parents last week and plans for this week are a bit up in the air until I get my voice back! So I am going to plan meals as if we were going to be at home every day but hopefully we will get to visit my parents at some point. How much do you know about Iberian ham? I have to admit I was a little hazy - I knew it from restaurants and deli counters as a wafer thin type of cured ham from Spain but that was about it. In fact it's the pigs that are Iberian. They have dark skin and look black rather than pink, with long slender hind legs. They live in freedom and graze on acorns in certain parts of Spain, which apparently gives the meat a unique taste. It's quite interesting reading about the process to produce the ham from salting to washing, then the pieces are left for up to three month for the salt to permeate. The really unique bit is the way the hams are cured - hung up and exposed to the natural climate conditions for 18-24 months and after that aged in a cellar for at least another 12 months (usually 18). The secret of curing is passed down in families from generation to generation. It's also part of the famed Mediterranean diet - Iberian ham is high in monounsaturated fatty acids, protein, zinc and vitamins B1, B3 and B12, according to the information leaflet I received. 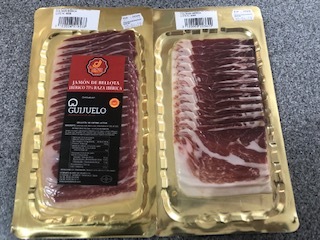 I was sent some Iberian ham by Ibeham, a project promoted by the Denomination of Origin Guijuelo (Spain). 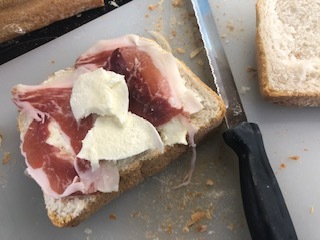 There are plenty of recipes on their site suggesting how to enjoy the ham but I wanted something fairly pure and simple, so tried it on a piece of fresh bread with some mozzarella and a little olive oil. The slices are so wafer thin they are almost transparent, separated in the packet by pieces of plastic so you can peel the ham off. Each slice has a ribbon of fat which dissolved on the tongue and the taste and texture were both top notch. There are a lot of recipes you can use this in but I just want to savour the flavour by itself! If you can get hold of some proper Iberian ham - and you don't have to go to specialist shops, Waitrose has some - then I highly recommend it as a little bit of luxury if you're just having a sandwich, or a platter for guests if you are entertaining. This time of year I love a bowl of warming soup for lunch with something on the side. 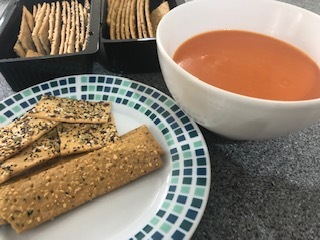 Ordinary bread is good but it’s nice to have something a little bit different especially if you are going for a plainer soup like my husband who only ever wants tomato. I used to make my own bread sometimes but the bread maker machine has made way for the steriliser and the Tommee Tippee Perfect Prep machine! 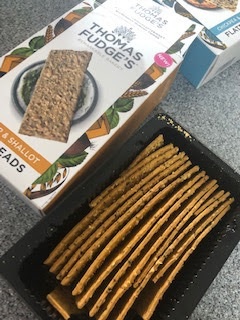 So I was pleased to come across these flatbreads from Thomas Fudge's's - they come in two delicious flavours, chickpea & sesame and cheddar & shallot. They are thin and crispy like crackers, so they are better dunked into a thick soup like tomato rather than a thin watery soup. You can also spread soft cheese, houmous or whatever you like on them, or use them in a dip - I’m planning to put these out with some dips at my daughter’s birthday party (for the adults). They also make biscuits for cheese and some flapjacks and Florentines which look very tempting! They also look like quite a premium product both with the packaging and the flatbreads themselves - the chickpea & sesame flavour has linseed, pumpkin and sesame seeds which you can see a lot of on top. The 140g boxes are only £1.89 and go a long way so I think these are particularly good if you are entertaining. Thanks to Thomas Fudge's for sending the flatbreads to review - all opinions are my own. What do you get for the man who has everything? OK not everything, but if there's something my husband decides he wants, one click of a button and it turns up the next day from Amazon Prime. It takes a lot of thought at birthday and Christmas to come up with something he will like but hasn't already bought himself, and I try hard to find slightly quirky or unusual gifts from independent retailers or online gift companies (one stocking filler I got him this year was a doorstop for his 'man cave' (study) carved with the word 'hodor'). Game of Thrones is all very well but not the most romantic inspiration when it comes to Valentine's day (I don't even watch the show but can tell most relationships on it have met a nasty end). Marmite may also not seem the most romantic of gifts - until you think of the famous advertising strapline: 'Marmite - you either love it or hate it'. Believe it or not, that advert was devised in the mid 90s, and has lasted so long that it's become a metaphor for anything people have strong feelings towards. People who love Marmite, love Marmite. It is a sign of true love for them to say they love you more than they love Marmite! So what better way to say I love you this Valentine's day than with a jar of Marmite? 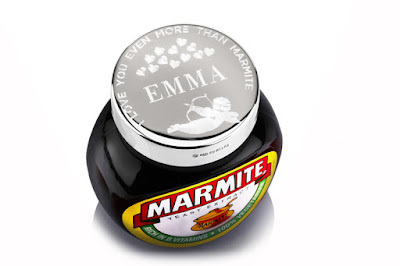 Well how about this: a personalised engraved silver Marmite lid that is a beautiful keepsake, and actually fits on top of your jar of Marmite so you can either keep it in the larder or on your bedside table (the engraved lid that is, not the Marmite - unless you really love it). There are a few different places that sell engraved Marmite lids but this one from The Engravers Guild has a beautiful design of a cupid and hearts and the words 'I love you even more than Marmite' along with the recipient's name. You could even get your own name as a keepsake for yourself! Made of solid 925 sterling sliver in a UK silversmiths, the lid fits a standard 250g jar of Marmite. The engraving is done with a diamond-tipped machine cutter so it will last a lifetime making this a really lovely keepsake for your valentine. This one, the sterling 925 silver, retails at £79 including the cost of the engraving and a gift box. 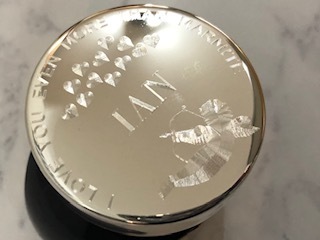 The Engravers Guild has some other options as well including a Brexit/Remainer version, a plain silver lid (£59.95) which you could have engraved with a message for a birthday or Christening or anything else, or one finished with 9 carat gold for £140 if you want to treat your love to something even more lavish. I love the way it has turned out - you can see more of the details on the lid in this close up photo above. Standard delivery is 3-5 working days but they also offer a next day service if you've left it a bit late - and the lid is of course delivered with a jar of Marmite! 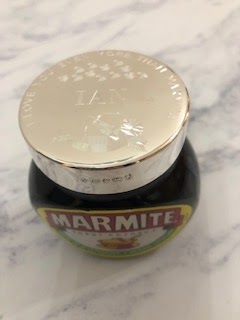 Thanks to The Engravers Guild of London which offers a range of personalised gifts for the complimentary engraved Marmite lid. All opinions are my own and this is not a paid-for post though I was sent an engraved lid free of charge. My mum has been in hospital for nearly four weeks after being suddenly struck by a serious illness but she is recovering really well and will hopefully be back home soon - a huge relief for all of us. I live a couple of hours away so in between visits I’ve sent her a few things in the post, including a get well card that I made in haste and forgot to take a photo of. 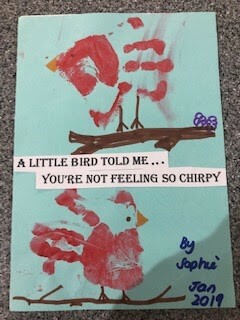 This is the second get well card I made, or rather that my ten month old daughter made. We go to a class occasionally called ‘Baby Picasso’ that is basically hand and foot painting with some messy play as well. There is a theme each week and we have the opportunity to make one picture or card or other item (before Christmas for instance we did tree decorations) using hand prints and one using foot prints. It gets quite messy - you have to put paint on your baby’s hand or foot and then stop them wiping it on themselves or you before you are able to get them to place it flat on a piece of paper! Then the other details and embellishments are added by the parent, as this particular class is for pre-walkers so the babies are too young to do it themselves. The theme this week was birds, and my little girl made a picture of two robins sitting on branches with handprints in paint. I decided to turn it into a card so when we got home I glued the picture onto a blank card and had a think about a suitable sentiment. The phrase ‘a little bird told me’ sprang to mind straight away then the rest followed and seemed perfect for a get well card - ‘you’re not feeling so chirpy’! I wrote the sentiments on the computer and stuck them on the front of the card and inside printed ‘get well soon’. I gave my mum the card when I went to visit a couple of days later addressed to granny from my daughter - she really liked it and hopefully it helped cheer her up a little bit! My mum is still in hospital (this is her 4th week) but she is recovering really well and I think pretty close to being allowed to go home, which is brilliant. I don't really know when I'm going to visit her in advance at the moment as it depends on when she is going home, what help she and my dad will need, and if I get any more job interviews - everything is quite up in the air at the moment really! 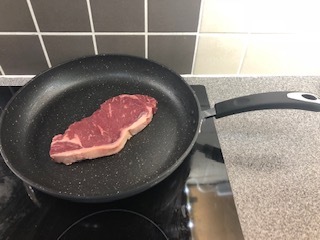 I've been winging it so far this week but had an online shop last night and realised if I don't plan meals, food will sit in the fridge until its use by date and I won't get around to cooking it. I also wanted to make some more meals for baby S though I seem to be running out of freezer space with all the little plastic tubs we've got in there now! So right now it's nearly 10pm and I've got two pans of veg cooking to make some baby meals - this is the first time I've been able to stop all day! I went to see my mum in hospital and we had something easy from the freezer for dinner when I got back, I can't even remember what it was! Dinner for us - burger and chips - not good when you consider what we had for lunch, this is why I need to plan - the planning starts here! Dinner for us roast chicken - it's not Sunday but why not, since neither of us is in work at the moment! Lunch for baby S finger food of pitta with fish paste, cucumber, cheese and any interesting fruit or veg I find at my MIL's! This is the first meal plan I've managed to do so far this year as 2019 didn't start off as expected - my mum was rushed into hospital on December 30th and spent a week in intensive care, most of that unconscious. Thankfully she is now awake and on the mend on a ward where she will be for a couple more weeks; I've been to visit several times already but then had a cold so was asked to stay away while her immune system is still weak. And with a job interview for myself and a meeting with a recruiter for my husband this week I'm not sure if I will be able to visit more than once this week (the hospital is a 2.5 hour journey away at least but last time it took me 4 hours to get back) and I've got a 10 month old baby at home to look after as well. So for the moment I'm planning to visit on Monday and then maybe later in the week again or at the beginning of the week after. I'm in London at a job interview this morning (on top of everything else, I'm at risk of redundancy as my role I'm on maternity leave from doesn't exist any more) so my husband will be holding the fort for breakfast and lunch. Lunch for us very excited today that I am having a proper 'dinner party' even though it's lunch time - you will be able to read more on the blog soon! I didn't do a meal plan last week, as I was really busy in the run-up to Christmas and also had some unexpected bad news to deal with. I realised just how much I rely on my meal plans - they do take a little bit of time but it's just once a week then for the rest of the week I just check back at what I was supposed to be making. Without a plan I really struggled and wasted time looking through the freezer trying to find something to cook. So this time I've managed to find time to do some planning! In previous years I've done a lot of festive baking at this time of year and it's a shame I haven't really got time to do any this year. I would have thought that being on maternity leave I'd have more time than when I was at work, but my gorgeous nine month old is pretty all-consuming and when I'm not feeding, changing or playing with her, I'm trying to keep on top of housework and life chores. Maybe next year she will want to join in and bake something with me! And then tomorrow is Christmas eve! What are you doing for Christmas? I'm really looking forward to my baby's first Christmas and thinking of all sorts of ways I can make it special. 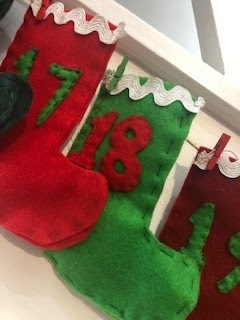 I wanted to have a handmade keepsake of some sort that would hopefully be in our family for years, and I hit upon the idea of an advent calendar - consisting of little stockings, each numbered 1 to 24, that I can fill with all sorts of things year after year. Given that I haven't done any sewing in years and can't think of any time I've ever sewed for fun, I found this surprisingly easy to make. It was a little time consuming but only because I don't get a lot of free time as I have an eight month old baby, and would sew a couple of bits in the evening here and there, over the course of several weeks. If you have a sewing machine that would speed up the process as well. 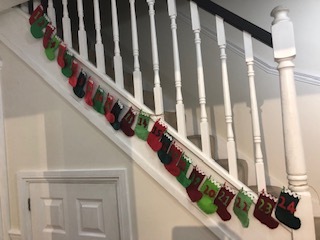 I used these Papermania 36-Piece Mini Pegs, Red/Green to attach each stocking onto a length of jute string which I then tied on to my stair bannisters. Attach the stockings to some string with the pegs; you could also sew loops into the stockings instead if you want. 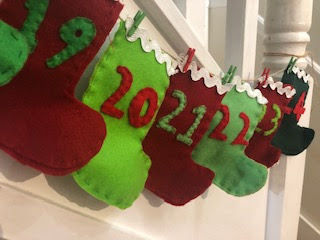 I'm really pleased with the way they turned out even though the stitching and numbers are slightly different on each; my husband says that just adds to the homemade effect and he thinks they will make a lovely Christmas keepsake. My daughter will be nearly ten months old at Christmas so won't understand advent calendars and I had considered just filling it with chocolates for us this year, but I saw a set of finger puppets on a site called Once Upon a Time that are designed for a baby's advent calendar, at a very reasonable price, so I ordered them back in September. They were supposed to be with me by early November but with only a few days to go until the start of December they still haven't arrived and the site owner hasn't responded to my messages, so I'm hoping they will still come in time - she has a few days yet! My husband is at home this week so I need to be a bit more creative with lunch ideas as I often just see what I can find in the fridge or cupboard when it's just me! On the plus side I should have a bit more time to make something for dinner or do some cooking for baby S with him to help look after her. Dinner for us salmon en croute and veg for me, chicken pie for him I was going to do last week but didn't. My little girl wasn't well last week - just a cough and cold but she was off her food and sleeping loads, so we went back to just milk rather than solids as she wasn't really up to sitting in a high chair eating a meal (she's only eight months so going back to milk is fine). Hopefully she will be back to her normal self this week! Dinner for us: pizza - I was going to make something else but the baby was crying and restless and I couldn't start cooking til 7.30 so frozen pizza it was! I was determined to use up my pumpkins in cooking this year and not just throw them away so as well as this pumpkin and gnocchi gratin I made a pumpkin pie. I've made a pumpkin cheesecake (vegan) before, and this chocolate pumpkin cheesecake, but I've never made an actual pumpkin pie before. I was spending the weekend with friends so a pie seemed like a nice thing to take; one friend is vegan so I needed to find a vegan recipe. 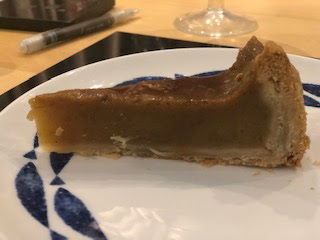 I had a look online and ended up creating my own recipe based on this one from Yummy Mummy Kitchen, but using shop-bought shortcrust pastry, which is vegan, and using my fresh pumpkin rather than canned, coconut milk and cornflour to thicken, and brown sugar and golden syrup to sweeten it. 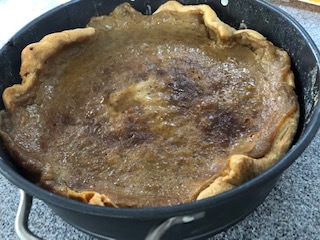 The end result was a soft baked pie filling, almost the consistency of a baked cheesecake, which tasted delicious! It was very popular with my friends, vegan and non-vegan alike. 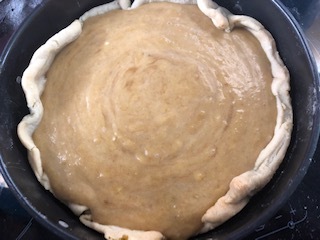 See below for the full recipe - I also want to mention here the vacuum seal food storage container from Ozeri that I used to transport and store my pie in. You get two large domed containers in the pack, and you simply close the valve at the top and push down to create a vaccum seal; when you want to open the container just open the valve. This keeps the food fresh and there's also a handy dial you turn to show which day you put the food in the container. 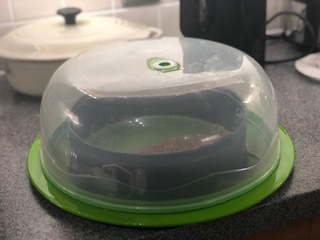 They are fairly large to store but are a nice sturdy design and I like the fact that the lid is clear plastic so you can see what's inside, so this is also a nice way to serve food for instance when you are outside in the summer and want to keep the insects away! It's currently available on the UK Amazon site but with fairly high shipping costs as it comes from the US, or you can find it on other Amazon sites which are cheaper to ship to the UK. Stew the chopped pumpkin in a pan of boiling water until softened then drain. Allow to cool then pulse in a food processor until you have a smooth puree. Preheat oven to 180C. Roll out the pastry and use to line either a deep tart tin or a loose bottomed cake tin. 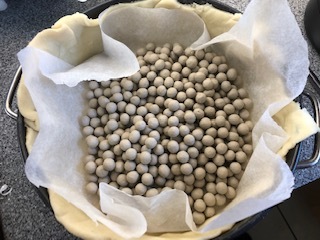 Line with greaseproof paper and fill with baking beans and blind bake in a preheated oven for 15-20 minutes until the pastry is starting to turn golden brown. Remove from the oven and allow to cook while you make the filling. 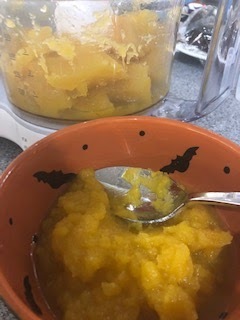 In a large bowl, mix the pumpkin puree, coconut cream and milk, golden syrup, brown sugar, cinnamon, nutmeg and cornflour and beat until smooth. Pour into the pie crust and return to the oven for 45 minutes. 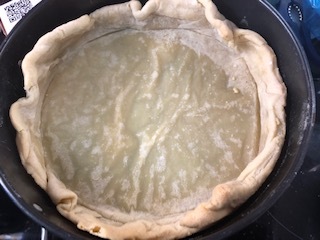 If the top of the pie starts to brown too much, cover with foil. Remove from the oven and leave to cool then chill overnight in the fridge - this should make the filling set. I'm sharing this with Baking Crumbs hosted by Jo's Kitchen Larder and CookBlogShare hosted by EasyPeasyFoodie. 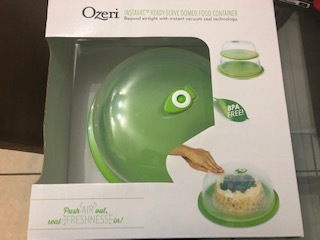 Thanks to Ozeri for the food storage containers to review. Around eight million pumpkins are expected to be thrown away in the UK after Halloween this year - and according to this Guardian article, only a third of consumers will cook and eat any of them. 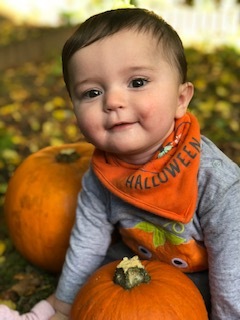 I didn't get around to carving a pumpkin this year but did buy two, for some photos with my little girl! I then made use of them in various ways - soup, pie, and this pumpkin and gnocchi gratin. The recipe is from an old issue of Weightwatchers magazine; but I added bacon lardons as well (if you want it without, this makes a nice vegetarian dish). I also used more cheese and allowed more gnocchi per person. 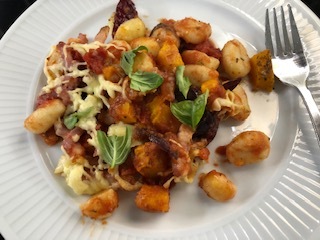 This is really tasty - I'm not a huge fan of gnocchi as it's very doughy and needs more than just a tomato sauce, but it works wonderfully in this recipe - you could also substitute the pumpkin for butternut squash. Preheat oven to 180C. Line a baking tray with foil and spray with non stick spray or pour in a little oil. 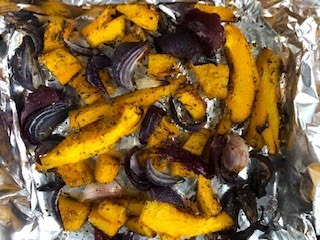 Roast the pumpkin, garlic, onion and sage, and sprinkle over some salt and pepper then toss in the oil. Roast for 20-25 minutes until the pumpkin has softened. Meanwhile fry the bacon lardons in a frying pan. Cook the gnocchi in boiling water according to the pack instructions - it only takes a few minutes. Squeeze the garlic out of its skin and mash with a fork, discarding the skin. 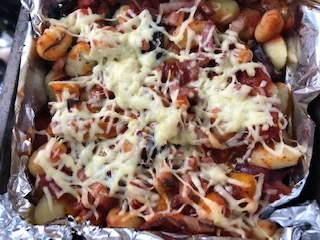 In a large ovenproof dish mix the garlic, pumpkin and onion, bacon lardons, gnocchi, then pour over the passata and gently mix in. Finally sprinkle over the cheese. Bake in the oven for 15-20 minutes; serve with a green veg like broccoli or a salad and garlic bread. A lovely winter warmer, and a good way to use up pumpkin so it isn't wasted. And here's my little pumpkin herself! I'm sharing this with Cook Blog Share, hosted by Easy Peasy Foodie. Now the clocks have gone back and the nights are drawing in, I'm thinking of cosy warming meals and making more use of the slow cooker. 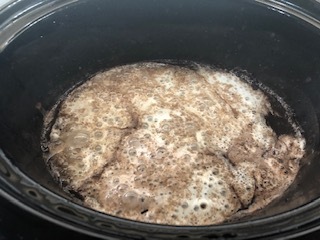 I kept seeing recipes for hot chocolate made in the slow cooker on the internet and decided to have a go. Be warned - this is a very indulgent recipe and a little goes a long way, but it's really something that should just be an occasional treat - perhaps after an evening of trick or treating or coming back from watching the fireworks. Whisk the condensed milk, milk, chocolate spread and cocoa powder and pour into the slow cooker dish. Cook on low for 2 hours, adding the marshmallows for the last half an hour. Once the slow cooker is switched off this will stay warm for a while - it's best served with a ladle and you can top your drinks with whipped cream or mini marshmallows but this was rich and sweet enough for me! 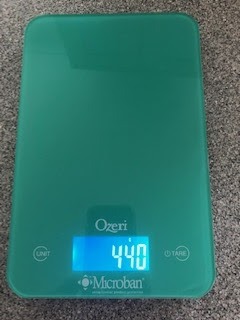 I used my new kitchen scales by Ozeri to weigh the ingredients - the Ozeri Touch II digital kitchen scale, which I like because it is so slimline, it takes up so much less space in my cupboard than other scales. It also comes in an attractive teal blue and is easy to wipe clean if you touch it with messy fingers! You can also choose whether you weigh in grams or ounces etc which is handy if you are following a recipe with measurements different to the ones you usually use and don't want to have to keep converting them! 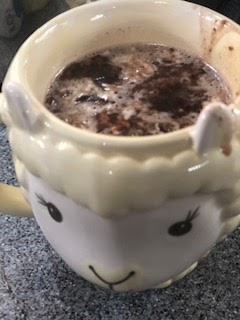 I also enjoyed my hot chocolate in my llama mug, because that's how I roll. Thanks to Ozeri for the scales to review, all opinions are my own.